Arctic region ports posted the strongest growth in freight traffic in 2016, up by as much as 40.6 percent, to just shy of 50 million tons. 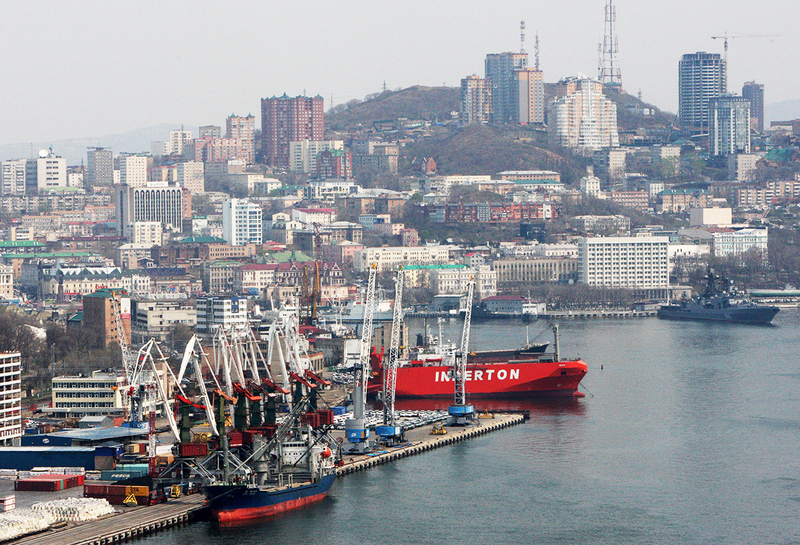 Photo: Panorama of the Vladivostok merchant seaport and the city of Vladivostok. New infrastructure, new ships and the overall situation on global markets means that an increase in maritime freight will continue in Russia despite falling oil production. According to figures released by the Russian Maritime Ports Association, the sector’s overall turnover rose 6.7 percent in 2016. Even a drop in foreign exports did not impact freight handling volumes, which grew over the last decade. Total turnover increased 77.4 percent between 2006 and 2016. Arctic region ports posted the strongest growth in freight traffic in 2016, up by as much as 40.6 percent, to just shy of 50 million tons. A key factor in this dynamic increase was a 120 percent rise in the handling of liquid cargoes to 23.1 million tons, a figure comparable to the 26.6 million tons of dry cargo handled in the Russian Arctic last year. Developments in Russia’s Far East was another significant factor, where there was an 8.3 percent increase in freight traffic at maritime harbors, to 185.5 million tons. A rise in the handling of liquid cargoes (+2.1 percent, to 74.5 million tons) was also registered, but the volume of dry cargo transit went up considerably, by 13 percent to 111 million tons. Coal was the dominant export at Far Eastern ports in 2016. Alexei Bezborodov, head of the research agency InfraNews, said that future freight traffic growth at Russian ports will mainly come from further export expansion. This derives from the lower ruble exchange rate – increased exports help to maintain the currency’s value. Bezborodov said coal shipping and container traffic has much potential for future growth. In 2016, the latter reached almost 4 million TEU (standardized units of container capacity), or 1.4 percent more than in 2015. In terms of weight, container traffic was up 2.5 million tons, with laden container transit increasing and unladen traffic on the decline. Finally, for the fourth year in a row Russia’s port sector saw a boost from the ferry crossing the Kerch Strait. Cargo handling at Port Kavkaz, the departure point for ferries to Crimea, increased 8.8 percent last year, to 33.2 million tons, while the port of Kerch saw a 22.4 percent increase, to 9.6 million tons. In a couple of years, however, the dynamic growth rates at these ports will disappear of their own accord with the opening of the bridge to Crimea, Bezborodov noted.